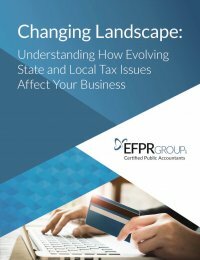 EFPR Group has just released an e-book on State and Local Tax (“SALT”) related topics, including the landmark South Dakota v. Wayfair decision which has raised concerns for many online sellers and multi-state businesses. For a free copy of our e-book, as well as a free consultation with one of our SALT team members, please download here. In the months since the Wayfair decision was handed down, most states have adopted similar economic nexus provisions or policies that require remote sellers meeting certain sales thresholds to collect and remit tax. Not sure if your company will be impacted? Contact our team today!